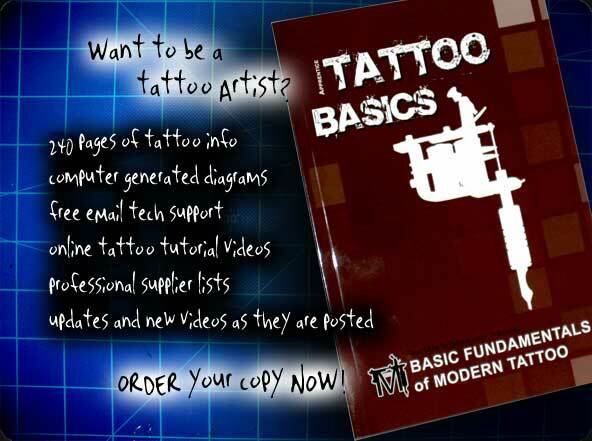 For a limited time, we are including Basic Fundamentals Of Modern Tattoo by Charles Jordan - a 240 page tattoo instructional book - ($49.95 Value) FREE with all tattoo kit purchases. This book will NOT teach you tattoo, but it does cover everything a tatoo apprentice should know! Are you a tattoo apprentice? Are you a professional tattoo artist who has an apprentice? If so then you could probably benefit from this textbook. Basic Fundamentals of Modern Tattoo does not claim to be some "Tattoo Bible" or the "A to Z" guide. This book will not promise to have you opening your own tattoo studio with a perforated business plan that is located on page 105. Basic Fundamentals of Modern Tattoo is realistic, and any professional will tell you that a realistic outlook on the tattoo industry requires the intent of a full apprenticeship. Each book also includes a login and password to access http://teachmetotattoo.com/portal/. The portal is an advanced search engine and database that catalogs a lot of the topics in the book, and allows you to ask specific questions about individual sections of the book. You can see responses from other apprentices who own the book as well. Gain access to photo and video tutorials. The portal is expanding rapidly and more topics are added daily.